↑ "Background Note: Guinea-Bissau". US Department of State. December 2009. Retrieved 7 February 2010. ↑ Department of Economic and Social Affairs Population Division (2009) (PDF). World Population Prospects, Table A.1. 2008 revision. United Nations. http://www.un.org/esa/population/publications/wpp2008/wpp2008_text_tables.pdf. Retrieved 12 March 2009. 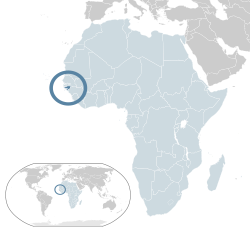 Note: According to email information by the Instituto Nacional de Estudos e Pesquisa, Bissau, the preliminary results of the national population census in Guinea-Bissau put the figure at 1,449,230. ↑ ३.० ३.१ ३.२ ३.३ "Guinea-Bissau". International Monetary Fund. Retrieved 17 April 2013.